It’s fun (and easy) to get sneaky with meatballs. Their texture allows you to incorporate all sorts of healthful ingredients that your picky eaters would never suspect. I took full advantage and experimented with zucchini and oats with my latest rendition. Try ’em tonight! Shred or finely chop zucchini, carrot and onion in a food processor. Scoop the mixture onto layered paper towels and squeeze out as much moisture as possible. Add the vegetables to a large bowl along with ground turkey, Parmesan, eggs, oats, garlic powder, Italian seasoning, red pepper flakes, kosher salt and black pepper. Mix until well combined. Set aside. In a large pot, add 2 jars marinara sauce. Shape turkey mixture into medium-sized balls (approximately 44) and carefully add each one to the pot of sauce (it’s OK if some are on top of each other and not submerged in the sauce). Do not stir or the meatballs will break apart. Cover the pot and simmer 20 minutes. 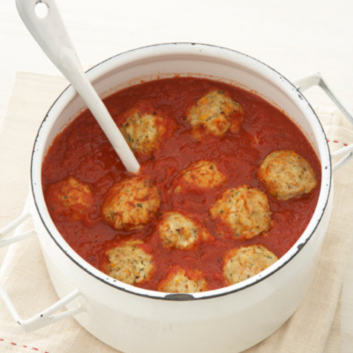 Uncover the pot, gently stir the meatballs so they are all covered in the sauce, and simmer for an additional 20 minutes. Serve over steamed greens or with whole-grain spaghetti. Note: Each meatball is 35 calories without the sauce and 50 calories with the sauce. If you serve 4 meatballs with 1 cup of pasta, the total will be 420 calories.